Melissa Hefferan (on the left) wears a plaid dress with ruffles at the shoulder and a white collar; her shoes are high white shoes typical for young children at the time; and her blonde hair is cut in a Dutch bob. 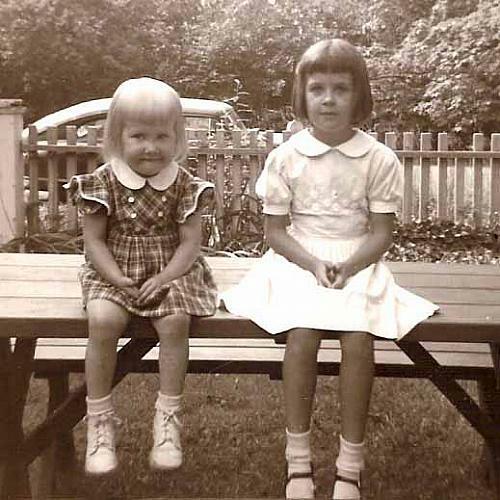 Her sister, Priscilla, wears a dress with puffed sleeves and a white collar; her white anklets and Mary Jane shoes are also typical for little girls at the time; and her hair is also syled in a Dutch bob. They are sitting on a picnic table and the white picket fence defines the yard. An undetermined automobile is parked behind the fence. Title by cataloger. The children of Mary Hefferan's adopted son Albert and his wife Elizabeth.